* Players can acquire new materials (Dragon Blood Stones) from a daily quest there, used for rank 8 reshapes, new skills, War Avatar cards and Nuema Essences. All instances have adjusted difficulty and rewards to make it appropriate to the server standards. * Collect cards based on famous friends and foes of Perfect World to boost your stats! * Improve your character and unlock new achievements with Realm Level System. 1. Bridge Battle: An intense and exciting 10v10 choke-point battle with the goal destroying all of the enemies towers! 2. Crystal Contest: A strategic 20v20 battle for control of 5 point generating crystals, ending when one side has reached 99 points! * A new system allowing the player to increase their stats! * Requires the use of Mystic Pills and Holy Pills, available in God's Giving. * Venomancers can now upgrade and evolve their pets with the use of Feral Soul Stars available in Events Forge, Boutique or New Daily Quest in at Mrs. Zoologist. * It will require completing 12 gold runs of first three maps in Lunar. * New series of world-events will now award players with new Titles. * Obtaining these titles will also improve players' stats permanently. These quests have been grouped, so they can be found easily. To check all the available quests, please pay attention to the Legendary, Adventure and Daily quests in the Available quests list. They usually have really good rewards and are worth completing. * Players may now choose to locate other players who match each other's playing preferences. * Click the new Perfect Match UI at the menu in the right bottom to begin. * It now allows you to automatically form squads for events, and even teleport directly there with a new God's Giving item, Angel of Wishes. * Located in the Event Calendar, players may now Check-In each day. - PW Boutique Agent allows now to replace soulgems inside weapons or armors without a need of purging all the stones. - You can now Right-click to put materials into the production interface when crafting from forges. - Added spaces as acceptable characters to the gear signature feature. - The PK Protections button has been moved above your health bar. - Macros can move to the next skill in the chain if one is on cooldown instead of stopping. It won't skip two. - The Boutique now has options to request and send items to players in your friend list. - The level 1 skill to Fox Form/True Form with the new forms for the Venomancer/Barbarian class bug has been fixed. - New passive skills weren't introduced either. They increase critical hit rate, skill damage and defenses. We don't need those since our critical hit, damage and defenses are already very high. - Set bonuses from War Avatars have been removed. It will introduce more variety and help balance things out. - Attack and Defense level for R8 armor set bonuses have been changed slightly for some classes. More details here. - New fashion, mounts and flights along with our custom versions will be added with next patches! Talk to General Summer in Archosaur (521, 629). Take the purple quest ‘New Horizons – Summer Reawakened’. Talk to the Primal Messenger in North Archosaur (564, 675). Choose the first option in the list to answer correctly. Talk to the Messenger of Time on the platform above the middle of Archosaur (552, 654). Go to the Worldspire in the City of a Thousand Streams (123, 856) up to a height of 46. You should get a popup on the platform. Talk to the Archosaur Student in North Archosaur (564, 673). Talk to the Messenger of Time on the platform above the middle of Archosaur (552, 654) again to enter the Primal World. Select ‘Door to the Primal World’. Welcome to Kirin Town in the Primal World. Meditate for 10secs until the counter runs down. Stand then meditate again for 10secs until the counter runs down. Now you will be able to start levelling your Arcane & Mirage Sky to get new skills. To level your Arcane and Mirage Sky, use Arcane Sky Pill - . This item can be bought from God's Giving>Utility. Your Arcane Sky has now changed into Mirage Sky. You can level this the same way as Arcane Sky. Reaching Mirage Sky X will allow you to learn all your Primal Skills. The quest can be taken at the Mrs. Zoologist (585 620) in South Archosaur once per day. You must pick up a pass first by accepting the yellow quest from her, the pass only lasts 15 minutes so you must enter the instance before the timer ends. To enter, pick up the blue quest from her. When you first enter, there is one NPC that you must talk to, this will spawn another NPC, along with guards and a puffbird. The first time you enter the instance there will be a one-time only quest you can recieve from the second NPC where you can exchange one Feral Soul Star for 140 Stars back. Normally the NPC will only exchange 1 Star for 10 back, so make sure you pick up the quest the first time you enter. Now onto the instance itself. There will be waves of enemies you need to defeat, which spawn from a purple portal, in order to recieve credits. There are 10 waves, they will be random after the first, and the last one will be a boss. You use the guards and puffbird to your advantage as they will help you kill the waves. In order to activate them you need to attack them. The puffbird only does debuffs(you can cycle through debuffs by attacking again) while the guards will attack. Attacking a previously activated guard will switch them between flame (magic) and physical attacks. Activating a new guard costs credits, so be careful. P.S. Watch out for the Sly Fox! So why do you need to do this daily? To evolve your pets, of course! Evolving your pet has a number of benefits, both cosmetic and stat-wise. Not all pets can evolve, so please keep that in mind. Once a pet is evolved, it will upgrade its stats based on the Venomancer's stats and equipment (at the time of being summoned). Feral Soul Stars (available from the Daily, Boutique and Event Forge) can be fed to pets to level them, or they can be used to evolve them (if the pet is 100+ and able to evolve). Chi stones can be used in combination with Stars for leveling/evolving/mood rerolling/ect. You can do this by opening the "training" window from your pet bag (there will be an icon above the "stow" button). When pets evolve they acquire a new skill unique to that pet. IMPORTANT: When evolving custom pets, press ESC as they will not go through the normal evolution animation correctly. HP = (Venomancer's HP/ Venomancer's Level)x(a constant number = 24) + Pet HP stat = overall HP of the pet 5% bonuses from equipment seem not to affect the pets. Defence = (Equipment + Resistance Adds + Shards)x(Inherit Coefficient) = overall defence of the pet Includes both physical and magic defence. Legendary pets (Herc and Nix) can now traverse air/land/water after they evolve. Monkey and Harpy can do this from level 1. The mood of your pet gives the pet two brand new skills. Over 70 moods are available and each pet has access to 30 out of 70, the types of moods vary per pet. In order to change the mood your pet has, you must enter "Mood Training" and reroll for a new one, you can choose to change to the new one or keep the old one. The materials required will still be used in either case (Stars). Mood skills cannot be leveled, you can only reroll. Lastly, you can increase inherit stat values of your pet by Reshaping. With this you can also choose to keep the old stats or use the new ones. New Legendaries can be bought from the Pet NPC for coins. Ice Stick - spam-able ranged water damage single target attack. It deals pretty decent damage and the best part is that it's literally spam-able at 1.0 second cooldown. Fallen Leaf and Flying Flowers - spam-able wood AOE attack, 10 meter radius. Like Ice Stick is deals good damage and has a 1.0 second cooldown which makes it a lovely AOE to have. You can set it up as continuous AOE if there's some invisible target around and you can leave the Harpy to AOE on it. Bare-handed Cut - 3 second AOE stun with a 30 second cooldown, 10 meters radius. It's pretty neat and if your Harpy has the Mood that includes Petrification then you'll have a pet with a permanent anti-stun and the ability to AOE stun every 30 seconds. Only works on monsters. Deals physical damage. Claw - Increases attack by 30%. Spirit Destory - Harpy's exclusive pet skill upon evolving. Increase HP by 30% and skill damage dealt on monsters by 30%. Rule The World - a hard hitting single target attack that also increases pet attack by 30% for 10 minutes upon landing, freezes target for 2 seconds. Heavy Load - 15m range 2 second AOE stun with a 15 second cooldown, 6 meter radius. Stuns players only. Pounce - Has 80% chance to stun the target for 3 seconds. Flesh Ream - Bite an enemy, inflicting base damage plus 200% of Pet's base damage over 9 seconds. Combat Saint - Monkey's exclusive skill upon evolving, increase HP by 30% and reduce damage taken from players by 60%. The damage reduction is effective and noticeable. This gives the Monkey more options for moods as other pets would be adviced to have a mood that contains Ghost or Spirit. Other pets lack player damage reduction buff otherwise. The Meridian System is a brand new way to strengthen yourself! To open the the Meridian interface, simply open your bag (B) and click on the character silhouette in the center. Once done, you can see a new window showing your Governing and Conception Vessels, and also the stats you have obtained through the Meridian system. When you first begin there will be one Meridian available, showing the circle slightly lit while the rest are greyed out. Once clicked on, you will see a window showing all 48 possible Gates within that Meridian. Only 25 of those Gates are "Living Gates". The Meridian will only be unlocked once you find and attack one of those Living Gates. There are two types of attacks, Mystical and Holy. Mystical attacks are done with Mystical Pills. Holy attacks require both one Mystical and one Holy Pill. The number of Holy attacks you can do per day is higher than Mystical, 50 per day you have logged in for a max of consecutive two days, meaning 100 attacks. To obtain these pills you can accept a quest chain from PW Promotions Agent which will give you 200 of each Pill. After that, they can also be bought with coins from the God's Giving NPC. Once you have unlocked all Meridians you may attack the center and unlock the next level of Meridians, which can prove to be more challenging. Two new Nation War maps have been added with this update, bringing more variety to your weekly PvP escapades. 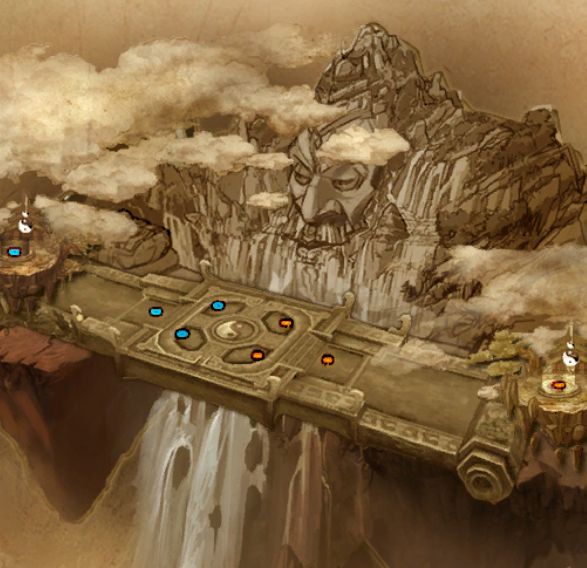 But fear not, the old Nation War map type will still be available, with the other two sprinkled in across the map. Before you enter a Nation War map, it will state which map type it is, so keep that in mind. Be the first to destroy nine of the opposing team's pillars. This map is far more simple and direct. Each side has 3 pillars which you must destroy 3 times each in order to win, the pillars themselves are not completely defenseless so don't get too greedy. Fight to claim crystals, obtain 99 points or the most points after 25 minutes. Each crystal starts in True-Neutral and will switch to either Neutral-Defender or Neutral-Attacker, depending on which side activates the crystal. If then the crystal goes untouched by the opposing side for 30 seconds, it will go into the Occupied state. But if the opposing side does activate the crystal before that time, it will switch to the opposing Neutral state. Once in an Occupied state, the team who is occupying will obtain points while the crystal is Occupied (as stated above). But, the opposing team can activate it to turn it to their Neutral state and repeat the cycle. Cards which will increase various stats. To view the War Avatar interface, simply click the button in your bag (B) and click on the "War Avatar" button. - Yellow quest chain "Deja Vu" that starts with General Summer (521 629 in Archosaur). Follow the quest chain to receive packs that reward you with a random grade B, A or S card. Primal World entrance quest (purple New Horizons – Summer Reawakened quest) chain must be completed as a prerequisite. - New daily quest "Assault on Sky Owl" inside Primal World (Sky Owl Stronghold area, NPC will teleport you there, 349 469 Resistance Force Spy). - New instance inside Primal World, Flowsilver Palace. Exchange rewards for packs that contain a random card. 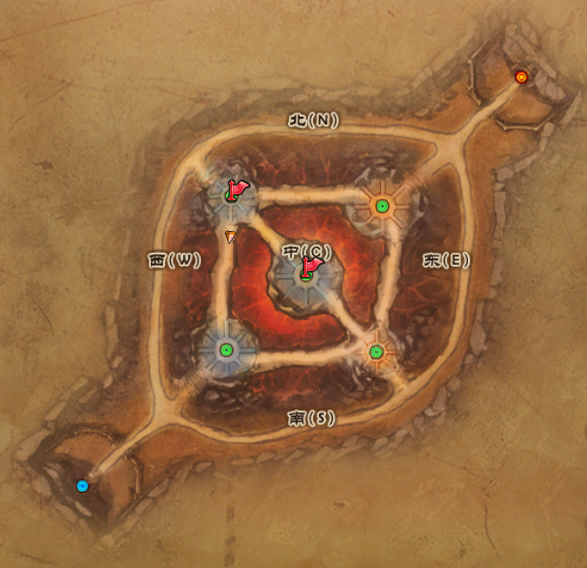 NPC is located in Kirin Town (Primal World) at 380 467. 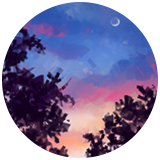 - New event, Sunset Valley Bloody Battle. Runs on Tuesdays and Thursdays between 19:00-20:00 server time. 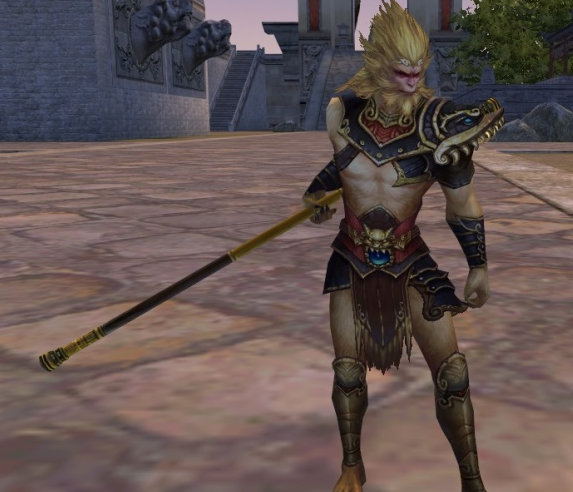 - Boutique item, War Avatar Pack(S-B). When you hover over a card it will tell you where it should go by saying, "type ___" under its grade (C, B, A, S). This tells you which slot you should put it in to get full bonuses. Cards can be unequipped. This also shows what stats they give and which Nuema type the slots offer. Curious about the possible stats you can get? Cards cannot be leveled or reawakened and card set bonuses have also been shut off due to balance reasons. These multipliers apply to card base stats, stats from leveling up cards, and to the stats you get from Nuema. Others are 100%. Another important note is cards require Leadership to be equipped. You automatically start off with 10, but higher cards require more Leadership points. In order to get more you'll have to buy War Avatar Cataclysts from the God's Giving NPC and talk to the War Avatar Master NPC in Kirin Town, Primal World. Nuema, just like cards, gives you extra stats. Each has tiers (per card slot/position), so in order to max them out, you need to absorb more Nuema until you reach the next tier (rinse and repeat). You can either open Nuema Chests (Tier 6 only, Boutique), exchange for Dragon Blood Stones(Crimson Officer-Cromagnon, Resistance Force Leader-Primal, Undercurrent, Flowsilver), or kill bosses (see below). 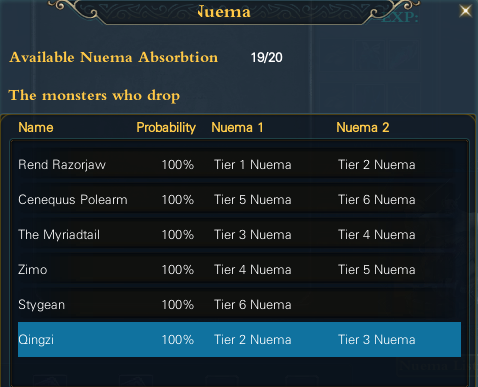 Every day the server will select random bosses that will drop Nuema orbs. Open your War Avatar interface and click the Nuema Listings button, this will show the list of bosses for that day. Each boss will drop an Origin Orb with a chance to drop an Essense Orb(give triple exp compared to Origin). 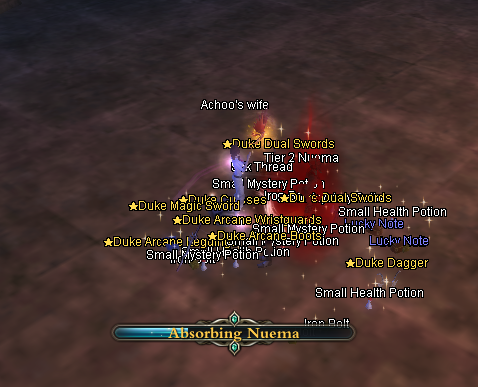 But it is not just an item drop, you will see an aura on the ground, you must click on it to absorb it. The Orb will now be in your inventory, right-click on it to use it. Each boss only drops one orb per kill, so it's better to do them solo rather than in a squad. If done in a squad, a random party member will receive it no matter who absorbs it. You can absorb only up to 20 orbs per week. The limit resets every Friday-night/Saturday-morning (in other words Friday night at midnight server time). 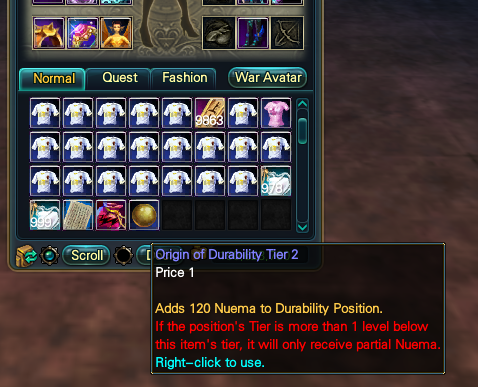 Access the Nuema Listing window to check your orb limit (at the top). Taken from here with minor edits. Please let me know if anything is wrong as I was not going to go through and test all of them, thank you. Titles can be obtained by completing quests and other actions. 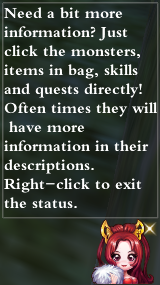 To find available title quests in the area, click on the scroll icon near your minimap. Upon completion of those quest, open character screen, click on Title List and then Owned Titles and you can select any available title that you wish to wear next to your character name. Not all titles give stats, but a good number of them do. The stats you acquire are automatic and permanent, so you don't need the title equipped to get the stats from it. Note: Titles come in various colors, some do not look as good as you would hope. There are quite a number of quest chains available in which you will obtain Seals. You get several titles while doing the quests and can obtain titles through having a set of titles. Getting Started: Click on the scroll icon on the top right corner of the screen to open up the title quest menu. Select the first quest, and click on challenge. This will give your first seal. - Go inside Eden. Clear up to 'Phlebo'. The spot is right next to the pillar of duty (381 594) to get the quest. - Teleport to Avalanche village to get the seal. 1. [Aviator](+3 phy-att): Fly to an altitude of 79". 5. [Marshal's Deputy](+5 mag-att) Stand on the Pirate Ship, far east of Arch (626 659) just before or just after Nation War (20:00 - 22:30 server time, Friday or Sunday). 7. [Demon World Traveler](+12 mag-att) Kill Borobudur Dungeon Lord within 60 minutes (Aba Weekly). 1. [Earth Born] Available for Earthguard characters. 2. [Lunar Destined] Available for Human characters. 3. [A Distant Melody] Available for Elf characters. 4. [Roiling Sea] Available for Tideborn characters. 5. [Primal Scream] Available for Untamed characters. In order to obtain these you must teleport to "Origination" (through the Illusion Stone), you will automatically receive a pop-up quest which you turn into NPC Qinglong. Talk to Qinglong again to get the "A Sacred World" quest. You will then be able to talk to your racial guide and receive the "Get Geared" quest, which will award you the title. 1. [War Avatar Rookie](+2 phy-att/mag-att) Collect 20 unique War Avatar Cards (duplicates does not count). 1. [Son of Fortune] (Expires after 30 days) Collect 5 'Auspicious Son' from the 'Fortune from Heaven' Event. 2. [Haste Up] (Expires after 30 days) Collect 'The Hasty Man' from the 'Quick as the Wind' Event. Creating customized characters has never been so in-depth! 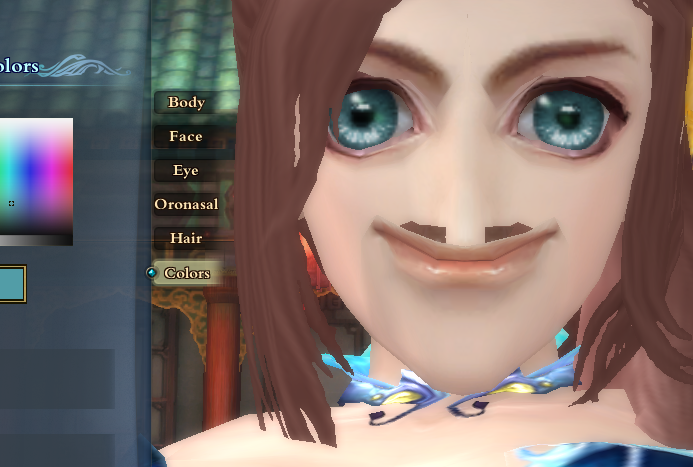 More variety is now available in character creator screen. Now you can spend less time worrying about ini edits and make some crazy faces with ease. Note: The first "vertical alignment" slider for eyebrows is actually "thickness". When making a new character it also shows more info regarding a class' play style and shows off some new animations and gear models. 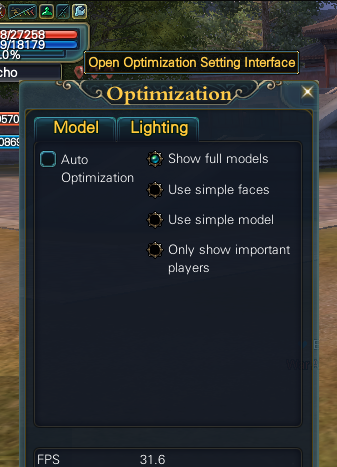 There are now more optimization options available for those having a hard time running the game smoothly. Simply click on the wrench icon above your HP bar. There are some UI changes you might notice, most might wonder where the "switch to PK" button went, along with protection/filter settings. You will see a new button next to your safety lock, with two weapons crossing or a shield. This is where you'll find them. You might notice a new little helper that pops up. Do not fret, she is there to help. If you click on her, your cursor will change and any items/gear/quests/ect you click on will make Sheomay open the Encyclopedia page regarding information about it. Rick-click to turn the cursor back to normal. If you don't want her help, simply click the book icon (Encyclopedia) near your minimap and check the "disable help" box. From here you can also click on her picture for her help if her picture on your screen disappeared. You can now access the Event Calendar easier. There is a new button with a 7 on it near your mini-map. It will open a window showing info about events, being daily, weekly and even instances. Here you can even view what sorts of rewards you will receive. You can also form a squad or teleport instantly to the instance (requires Angel of Wishes item from God's Giving), if it's available at the time. 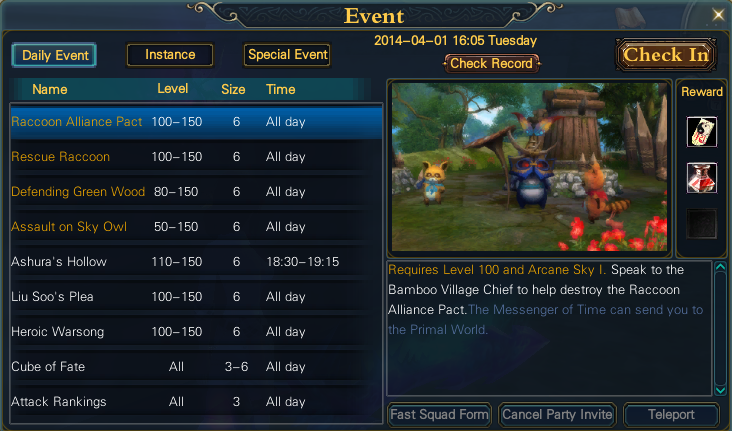 Note: Here you can also view the server time/date as well as a daily attendance. To craft new skills you must first enter Primal World by following the purple quest chain "New Horizons - Summer Reawakened". Once you enter Primal World, you must do your Arcane and Mirage Sky quests (from the Sacred Mirror NPC), and level them accordingly. The books will require you to exchange Old Book Pages for Arcane/Adv. Arcane and Mirage/Adv. Mirage Pages (at the Sacred Cauldron). You also need Primordial Blood. an additional 300% | 400% of weapon damage plus ??. Meters, dealing base physical damage plus 7241 | 5416. Demon version generates 20 Chi. Demon version generates 25 Chi. Sage interrupts target's skill upon a successful hit. Demon lowers the target's Evasion by 50% in 8 seconds. Sage has a 25% chance to increase your critical chance for 10 seconds by 20%. Demon slows targets by 65%. Resistance by 150% | 120% and Physical Defense by 120% | 150% for 15 minutes. Demon version increases Physical Defense by 150%. Demon version increases Health regeneration by 15 per second. Demon version increases Mana regeneration by 15 per second. base magic damage as extra Water damage. Lasts for 30 | 15 minutes. Demon version increases damage by 50%. 7021 Earth damage. Has 20% | 33% chance to stun it for 3 seconds. Fire: Has a 50% | 60% chance to stun the target for 4 | 3 seconds. Demon version increases the stun chance to 60%. Demon version enrages you for 6 seconds, increasing your Critical Rate by 40%. Demon version has a 25% chance to reduce Physical Defense by 180%. Demon version burns 2400 Mana. Demon version has a 50% chance to also stun the target for 3 seconds. player target by 50% | 35% for 10 minutes. Cannot be bound as your primary attack. Sage version increases damage taken by 50%. Demon version increases the Critical Rate of attacks against the target by 15%. 50% of the Defense Level reduction. Defense Level by a minimum of 20.
status effects from yourself to your target, and silencing the target for 3 | 1 seconds. Sage version silences targets for 3 seconds. Demon version also stuns the target for 4 seconds. damage plus 100% of weapon damage plus 1650 | 1100.
and Defense Levels by 10 | 12 for 3 minutes. damage and stun the target for 3 | 4 seconds. Sage version deals an additional 550 damage. Sage version has a 65% chance to apply Spirit Bore. Sage version has a 25% chance to apply Bloodletting. Demon version has a 20% chance to generate an additional 50 Chi. Demon version reduces Attack and Defense levels by 12 with Spirit Bore. Demon version stuns targets for 4 seconds with Bloodletting. reduces the target's Defense Level by 20 for 8 seconds. Sage version reduces the cooldown by 1 seconds. Sage version has a 40% chance to deal additional damage. Demon version reduces the cast time by 0.2 seconds. Demon version immobilizes the target for 4 seconds. remove the target's weapon for 6 seconds. Sage version deals an additional 660 damage. Demon version generates 15 Chi. additional effects based on the plant types. The range of each plant's explosion is 10 Meters. the cooldown is up to 50%, based on your Soulforce. damage. Mist's Grasp lasts 45 seconds or until activated. Sage version increases the damage of Mist's Grasp by 1800.
target's Wood Resistance by 15% for 6 seconds. Summon an elemental guardian to protect you. to convert your Mana into Chi for the Devil Chihyu. Sage version reduces the Mana cost by 10%. Grants the Devil Chihyu the Boost skill. Increases the Devil Chihyu's attributes. vulnerable, increasing incoming damage by 30%. effects. Deals full damage regardless of range. Costs 1 unit of ammo. Sage version increases the freeze chance to 25%. Additional damage is increased to 850% weapon damage. dealing an additional 630% | 600% of weapon damage as Wood damage. Sage version increases poison damage by 30%. Demon version increases the poison duration by 6 seconds. damage plus 6499 and knocks player targets back 9 Meters. Sage version generates 25 Chi. Demon version also grants you a also grants you a Level 5 Winged Shell. absorbing up to 1800 | 1500 damage for 20 | 30 seconds. Energizes you ever 3 seconds, restoring 80 Mana. Sage version absorbs up to 1800 damage. Demon version increases the duration to 30 seconds. Call down the blessing of the gods upon all allies within 15 Meters. Increases Magical Defense from equipment by 60%. Increases Physical Defense from equipment by 60%. Increases Magic Attack from equipment by 70%. Increases Mana regeneration by 20 per second. Lasts 1 hour. continues until your mana is depleted or the spell is canceled. within 15 Meters to exact divine judgment upon your foes. until your Mana is depleted or the spell is canceled. plus 25% of your base magic attack. Sage version reduces the channeling time by 0.3 seconds. 5266 | 6466. Reduces the enemy's speed by 50% | 40% for 10 | 8 seconds. Has no cooldown while using Violet Dance. Sage version increases the speed reduction to 50%, and the duration to 10 seconds. Demon version increases the damage by 1200.
target's Attack Rate by 50% | 65% for 30 seconds. Demon version reduces the target's Attack Rate by 65%. Demon version increases your Attack Rate by 25%. profusely for 9 | 6 seconds, dealing an additional 935% | 900% of weapon damage. Demon version reduces the bleed duration by 3 seconds. the target for 10 | 11 seconds, reducing speed by 60%. Demon version increases the slow duration by 1 second. your Attack Level by 40 | 35. Lasts 10 minutes. Has a 60% | 75% chance to stun targets for 8 | 6 seconds. Demon version increases the stun chance to 75%. Demon version increases damage by 500.
target by 50% | 40% for 8 seconds. Demon version has a 20% chance to drain 30 Chi from the target.